The Pars step up the pressure on St Mirren with an outstanding win against Dundee United which was a lot more comfortable that the 1-0 scoreline suggests. Tam McManus v Lee Wilkie. Once again Stephen Kenny had to make changes to his line up this time with Phil McGuire suspended. That meant Sol Bamba kept his place in defence alongside Scott Wilson. Stephen Glass came back into midfield next to Gary Mason with Adam Hammill dropping to the bench. So the Pars lined up with Dorus De Vries in goals, skipper Greg Shields at right back, Wilson and Bamba in the centre and Scott Muirhead at left back. The three man midfield was McCunnie, Mason and Glass. The forwards McIntyre, McManus and O`Brien. Jim McIntyre had a half chance in the first minute as he got onto a Bamba header but he was deemed offside. The opening minutes were quite frantic with neither side able to hold possession but it was the Pars that were getting the upper hand at this stage. In 9 minutes Bamba forced a throw in deep on the United right and from that resulted two consecutive corners for the Pars with O`Brien cross from the left was just missed by his teammates. O`Brien was busy on both wings and in 12 minutes he put over a great cross for McManus to head but Stillie easily saved. O`Brien then had a good run in from the right linking well with McIntyre then McManus before over running the ball. McManus had a great chance in 16 minutes from across by Shields on the right. Robson tried to hit back for United with a shot blocked in 17 minutes which was their first effort at goal. Then in 21 minutes a great chance for McIntyre to open the scoring when Glass fed McManus on the left and his good low cut back was met by McIntyre who hit over. Scott Wilson was ever attentive at the back and made a good tackle on Samuel to win possession in 27 minutes. Robson had another chance in 28 minutes from a free kick that he hit wide. Then the Pars opened the scoring after it looked as if United were doing exactly that. 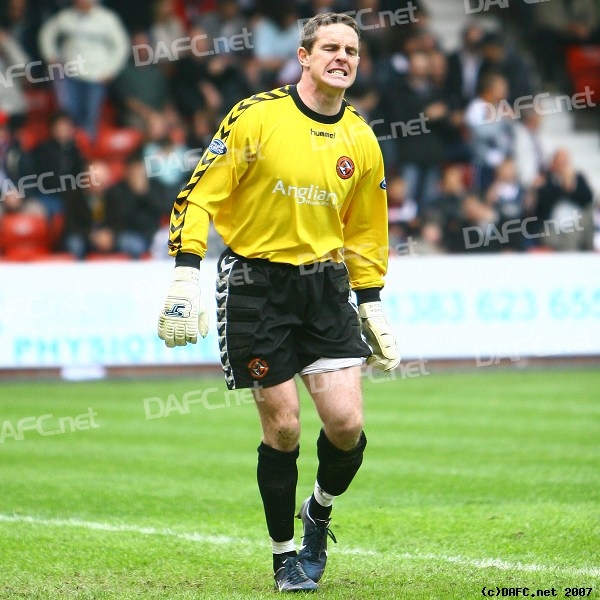 United Daly was one on one with De Vries and the keeper made a great point blank save. The ball was cleared up the Pars right and it was won by Shields who put over a low cross met by McManus on the volley to finish with style. East End Park exploded and it was no more than the Pars deserved at that point. sympathy in the background though. United had a free kick in 35 minutes but it was headed clear by the impressive Scott Muirhead who had played very well at left back in recent games. Former Par Noel Hunt was making a nuisance of himself when he and De Vries and Muirhead all tried to stand in the on same spot at a United corner. Eventually referee Freeland gave the Pars a free kick which did not stop the Irishman chasing the referee almost back to the half way line. Gomis was booked in 41 minutes as the Pars finished the half very much on top. Half time 1-0. No changes at half time for either side with the Pars now shooting towards the Halbeath end. Bamba had been very strong in defence and started the half with a good clearing header from a United shot. Stephen Glass had a great chance in 58 minutes to score when he broke forward and managed to work the ball past Stillie but it bounced high and his effort at an empty goal went over the bar when it seemed easier to score. Jim O`Brien made it to the bye line and knocked over a good chip which was cleared for another Pars corner. Tom McManus had a good shot deflected for a corner in 62 minutes. United made a double change in 63 minutes taking off Hunt and Gomis and bringing on Goodwillie and Easton. The Pars were given a free kick in 64 minutes despite the fact McIntyre was through although he missed his shot. Glass hit the free kick well over. 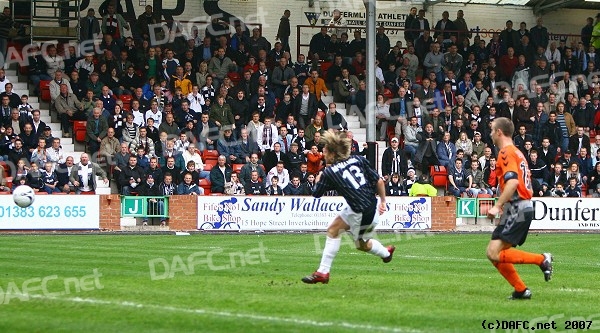 Tam McManus scores the winner! There was a close thing for United in as De Vrie smissed a cross which Daly headed over from almost next to the Pars back post. McManus seemed to have picked up a knock and was given a standing ovation by the Pars fans as he was replaced by Adam Hammill in 70 minutes. Lee Wilkie claimed a penalty in 71 minutes but Freeland was not interested. 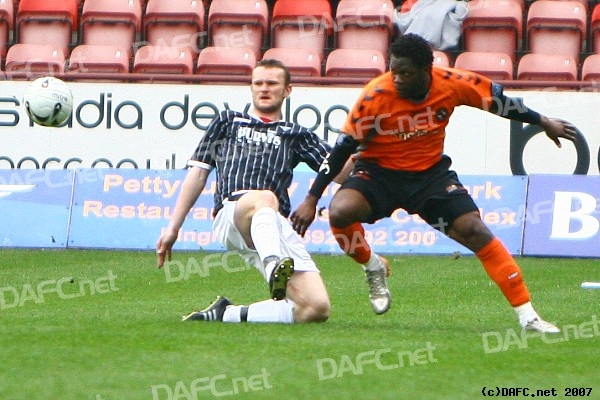 Dunfermline Athletic vs Dundee Utd. Andy Tod testimonial match details!